OK, so the biggest storm of the year just happened, but you never know when the next one will hit. 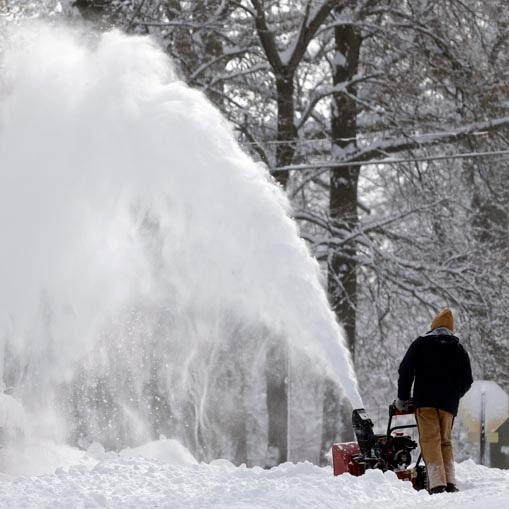 You might have given up on your snow thrower that will not start. I would have, but it’s only a few years old and I was determined to get it fixed before the big storm. Here’s a couple things that seemed to work. 1. Remember to always run the gas out of the machine at the end of each year. I didn’t do this, and I believe it led my problems getting it started this year. Over time the old gas turns to a varnish, gums up and attracts water in the carburetor. 2. Change the spark plug and check the oil. 3. Drain the old gas by removing the screw at the bottom of the carburetor. 4. Spray some starting fluid into the empty gas tank and into the hole where the spark plug goes. Read the directions for proper use of the starter fluid. 5. Put fresh gas into the engine along with some fuel stabilizer. 6. Start with the choke on and with the run lever on slow. This might take a good 20 pulls, so keep trying. If that doesn’t work you can always take it to the shop. Always work in a ventilated area and when draining oil and gas, make sure to dispose or store in the proper manner. Good luck.